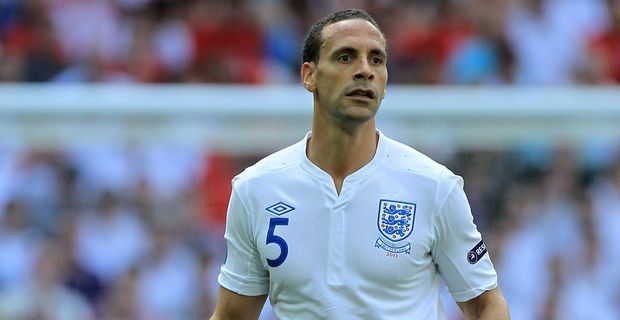 Rio Ferdinand has made a surprise return to the England squad. In an about turn, Roy Hodgson has included the 34 year-old Manchester United defender in his selection for upcoming World Cup qualifiers against San Marino and Montenegro. Ferdinand has not been involved with England since 2011. The Ferdinand affair has been the only blemish on Hodgson’s promising first year as England manager. Hodgson had said that omitting Ferdinand from Euro 2012 was purely a football decision, when everybody else in football assumed it was related to John Terry’s racist remarks directed at Rio’s brother Anton. With Terry out of the picture, Rio was the obvious choice now that England’s centre back options have been depleted by injury. Hodgson was sticking to the "football reasons" line for selecting Ferdinand, but he might have to do some grovelling after the player believed he was treated unfairly. "I can't do more than I am now," Hodgson said, "giving him the chance to come back, asking him to come back, making it clear I would like to use him. I can't do more than that. If he has a grievance and does hold it against me because I haven't selected him previously, there is not much I can do about that." Hodgson will also have to play the diplomat in arranging peace talks between Ferdinand and Ashley Cole, after the Manchester United player retweeted a Twitter post last year calling Cole a "choc ice" for supporting Terry. "We are talking about two very experienced professional players and I don't envisage any problems," Hodgson said. "I'm hoping the long-term friendship can re-emerge and any unfortunate incidents that have happened along the way can be forgotten." With all that going on, it is to be hoped that Hodgson has time to actually think about the two crucial qualifiers. Ferdinand, normally a constant Twitter presence, has been reticent on the subject. "Rolling into training with a wry smile, everyday lucky to be doing something that I love," he tweeted his four million followers.